These principles have been developed over the years to provide Rotarians with a strong, common purpose and direction. They serve as a foundation for our relationships with each other and the action we take in the world. FOURTH: The advancement of international understanding, goodwill, and peace through a world fellowship of business and professional persons united in the ideal of service. We channel our commitment to service at home and abroad through five Avenues of Service, which are the foundation of club activity. Club Service focuses on making clubs strong. A thriving club is anchored by strong relationships and an active membership development plan. Vocational Service calls on every Rotarian to work with integrity and contribute their expertise to the problems and needs of society. Learn more in An Introduction to Vocational Service and the Code of Conduct. Community Service encourages every Rotarian to find ways to improve the quality of life for people in their communities and to serve the public interest. Learn more in Communities in Action: A Guide to Effective Projects and this Community Service presentation (PPT). International Service exemplifies our global reach in promoting peace and understanding. We support this service avenue by sponsoring or volunteering on international projects, seeking partners abroad, and more. Youth Service recognizes the importance of empowering youth and young professionals through leadership development programs such as Rotaract, Interact, Rotary Youth Leadership Awards, and Rotary Youth Exchange. Our main objective is service — in the community, in the workplace, and around the globe. Our Club adheres to the Rotary motto, "Service Above Self." 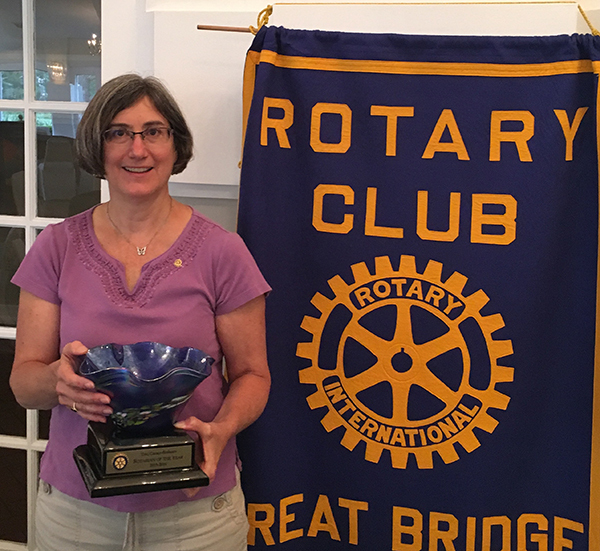 The Great Bridge Rotary Club was chartered on October 21, 1994. Rotary is a worldwide organization of business and professional leaders that provides humanitarian service, encourages high ethical standards in all vocations, and helps build goodwill and peace. The 1.2 million Rotarians who make up more than 34,000 Rotary clubs in nearly every country in the world share a dedication to the ideal of Service Above Self. Rotary clubs are open to people of all cultures and ethnicities and are not affiliated with any political or religious organizations. We are neighbors, community leaders, and global citizens uniting for the common good. With you, we can accomplish even more. The heart of Rotary is our clubs—dedicated people who share a passion for both community service and friendship.